When it comes to comedies, we may be looking back on Peeples as the surprise hit of the summer. The film, from writer and first time director Tina Gordon Chism, never plays its heartfelt humor to the lower ends of its audience's intelligence. As even evident in the Peeples trailer, the film gains its strength from how real its characters are and how the situations in this situational comedy are universally relevant. Craig Robinson (Hot Tub Time Machine) nails his first leading man role as Wade. He is living what he thinks is a blissful life with his live-in love, Grace. 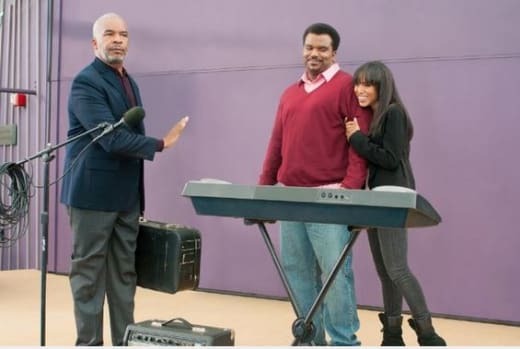 Kerry Washington continues her hit streak as Grace and the Scandal star crafts a soul who is equally a daddy's girl and an independent woman. See, when David Alan Grier is your father and S. Epatha Merkerson is your mother, those traits are hardly surprising. Knowing how judgmental her federal judge father is, she has failed to mention she's dating a man -- much less living with him -- who makes his living as a musician for kids. That becomes a problem and our movie hits its groove when Grace heads home solo for the weekend and Wade surprises her by showing up to finally meet the parents. Given this premise, Peeples could march to the pre-laid tracks of other hit films of its ilk, like... well, Meet the Parents. But with Chism at the helm guiding this charming film, it mostly avoids stereotype. Chism’s background certainly has helped her with Peeples. The writer-director cut her teeth as a writer for The Cosby Show, and her work as screenwriter on Drumline and ATL has certainly prepared her for the big time as a cinematic auteur. She knows family comedy and familial dynamics and weaves a web of it in Peeples that is unexpectedly rich and robust. But, since the formula is exactly that, formula, Peeples can’t quite help itself on a few occasions finding a familiar feel. There is the predictable final clash between father, daughter and wanna-be fiance that feels like it was literally ripped off from Meet the Parents, complete with Wade going home with his tail between his legs. How to avoid such cliches, we’re not sure… after all the film has to have its conflict. But there had to be some other way to have our protagonist leave the scene, while his love figures out that daddy was too overbearing without it feeling like a sitcom repeat. It is undeniable that Peeples possesses an innate attraction and should do quite well in a summer movie season that is awash in spectacle (The Great Gatsby) and superheroes (Iron Man 3). And with the landscape void of any kind of family film fun, Peeples scores immensely on many levels.